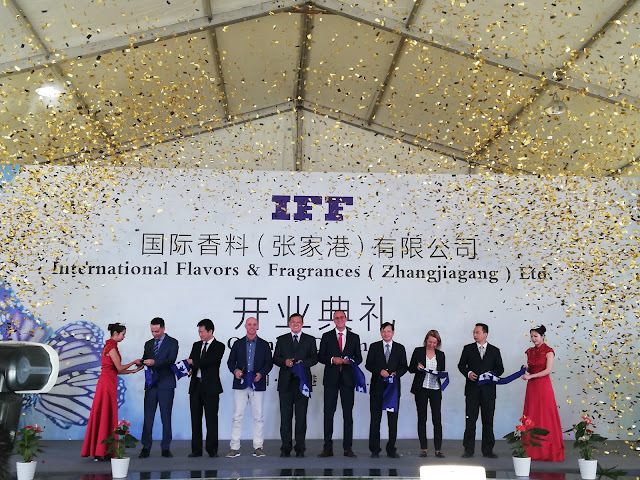 Earlier this week, IFF held the grand opening of our newest flavors manufacturing facility in Greater China. A significant milestone in our dedicated support of regional customers, IFF Zhangjiagang is a welcome addition to our strong presence in Greater Asia. The opening of this much anticipated IFF location brought local officials, customers, vendors and partners together with IFF regional and global leaders, including Matthias Haeni, IFF’s Divisional CEO, Taste. This site is environmentally responsible, complete with advanced odor controls and zero liquid discharge (it reuses all water on-site). It is also designated LEED Silver and is a natural fit in a country that champions LEED-certified projects. Initially, the site will focus on powder flavor production as we are transferring all blending and seasoning manufacturing from IFF Guangzhou to Zhangjiagang. Additional flavor technologies will come on line systematically. We are extremely proud of this site – from the more than 1 million hours spent during construction (and after) without a loss time incident to the production of tantalizing flavor sensations that reinforce our expertise in meeting local taste demands, our work in China is crucial in helping us strengthen and expand our portfolio. In addition to our Zhangjiagang facility, we are also celebrating a new Natural Products Research Lab in China on October 15th. Located in Nanjing Life Science Park in Jiangsu, it is our first R&D naturals lab outside of Union Beach, New Jersey. The lab is a state-of-the-art facility designed to extract flavors from natural resources and is positioned to leverage the historical expertise of local talent. ISIPCA- What is your dream?